The RSS has set about rebranding itself with the recent lectures given by Mohan Bhagwat. 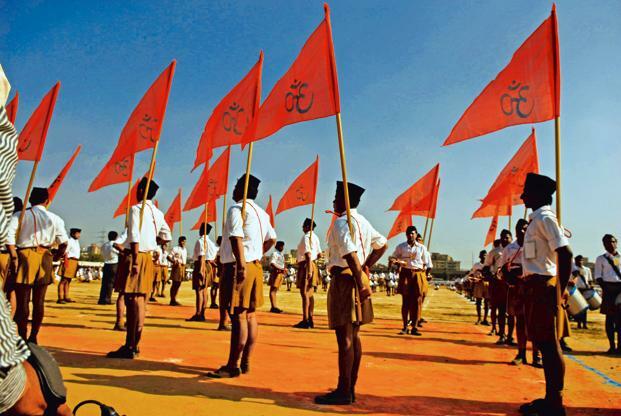 With the constitution, secularism, Hindutva and other such aspects being discussed, vis-à-vis RSS’s policies and thoughts towards them, the RSS seems to be undergoing a tectonic shift in its ideologies. The threat of normalising the RSS and it tenants however, appear to be minimal. Already, a barrage of articles have been written which catch the RSS out by giving examples of its past leaders (read hegemons), it past pogromspolicies and the general “bunch” of ideologies which go onto nullify this recent change in dialogue. While this superficial change in identity by the RSS might easily be trashed by those who have been witness to or heard about its grim intentions for India, which have been seen during the Ramjanmabhoomi Movement of the 80s and 90s, Gujarat in 2002, or even during Partition, it is India’s youth that are falling victim to this empty rhetoric. Being in Class 12 myself, I have seen many of my fellow peers falling for this rhetoric. Having researched on the RSS and other Hindu fringe elements for the past couple of years now, I do have the advantage of knowing the history of the organisation. This has enabled me to avoid accepting the RSS as what it wants to appear; a cultural organisation. However, not all my peers have this hindsight and hence, I do not blame them for forming a distorted image in their mind. After all, most of us have grown up without having borne witness to the times when the true form of the RSS revealed itself. Thus, this has led to an entire generation growing up believing the RSS to be harmless to the political, social and cultural fabric of our nation. Just recently, during a conversation about the RSS and its associated groups, I was horrified when a classmate of mine nonchalantly commented about the RSS being a ‘cultural’ organisation which aimed to preserve all that was ‘Indian’. Not only was the statement farcical, but the fact that a person who had grown up in favourable circumstances, and now on the verge of finishing primary education, was so oblivious to the RSS and its real aims presented to me the stark reality. The RSS, and all its subsidiaries, seem to be getting considered by my generation as normal entities of Indian polity. Of course, the primary reason behind this seems, as I said before, the natural naivety induced into us because of our age but after further thought, I realised that the fault also lies in the histories that we have studied. These histories while completely avoiding the RSS, fail to address the pressing issue of Hindu nationalism and its origin. This I feel has led to the current ignorance among the educated youth. A classic case of this can be found when looking at the Indian Certificate for Secondary Education (ICSE), an exam which has on average about one lakh fifty thousand students. The subject of History in the ICSE board, the exam of which I gave at the end of Class 10, has covered certain parts of Indian History in a highly spurious manner. This can especially be seen when most textbooks prescribed by the board address early Hindu nationalist elements. For example, chapters delving on the subject of early Indian nationalism cite Anandmath by Bankim Chatterjee as a stellar example of early nationalistic literature. These chapters however, fail to inform us that the original story was about a struggle between the Sanatan Dharm Army and a local Muslim ruler, not some patriotic struggle between Indians and the British. The actual intent of the story, instead of inspiring Indian nationalism, was actually promoting the idea of Hindu nationalism and its supremacy in Bengal. This lack of information, or rather this spread of misinformation, is widespread throughout its syllabi. Another example of masking early Hindu extremism is the way the syllabi has addressed the Arya Samaj. Rather than informing us about the religious intolerance spread by Samaj, ICSE history textbooks refer to the Arya Samaj as a movement which struggled for womens rights and the removal of the caste system. These books and their authors seem to have forgotten the Arya Samaj which considered only Hindus as the true sons of India and Muslims as outsiders. It seems to have forgotten Arya Samajists such as Bhai Parmanand, who considered Indian Muslims as mere invaders who were wrongly residing on foreign land. This masking is furthered when these textbooks cover the so called early ‘leaders’ of the nationalist movement. Although it covers, or rather glorifies, in great detail the impact of Lala Lajpat Rai and Balgangadhar Tilak had on the freedom movement, it completely ignores their Hindu nationalist ideologies. The fact that Tilak openly demanded for partition, or that Lajpat Rai called the Hindu community as a “nation in themselves” has been ignored. All that these textbooks seem to be doing is veiling Hindu nationalism and teaching it as a glorious part of the Indian Freedom Movement. Thus, the predicament before us, that of the lack of awareness about Hindu nationalism and its evils, seems like a systemic one. While changing the syllabi for entire education boards would be highly ambitious in the current political scenario, we must strive to increase awareness on such pressing topics and issues. Otherwise, we might end up with an entire generation believing that a dogmatic and sectarian organisation such as the RSS is a norm. This will only put the idea of India under greater threat, and may even lead to the eventual end of tolerance, secularism and pluralism in our nation.